Concord, North Carolina What spoke to me most about Diet For Living School was it's unique blend of training in nutrition, raw food preparation and professional development in the Holistic Health field. 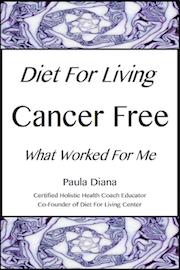 Paula's dedication, passion, drive, kindness and personal testimony of healing herself of cancer with Raw Foods also greatly encouraged me. I was also delightfully surprised by how easy it is to create healthy living foods and loved the hands on food preparation. The parts I enjoyed most in the program were the analysis of modern food history and disease causing elements. And finally the focus on holistic health business development. The knowledge gained is invaluable and without question will assist me in attaining my goals as a health advocate and entrepreneur.